Qatar declared it ‘abolished’ the Kafala system in December 2016, instituting a contract-based system in its place. In the last few months, thousands of expatriates have attempted to change jobs, taking advantage of new regulations that stipulate workers don’t need their current employer’s permission to change jobs at the end of contract period. 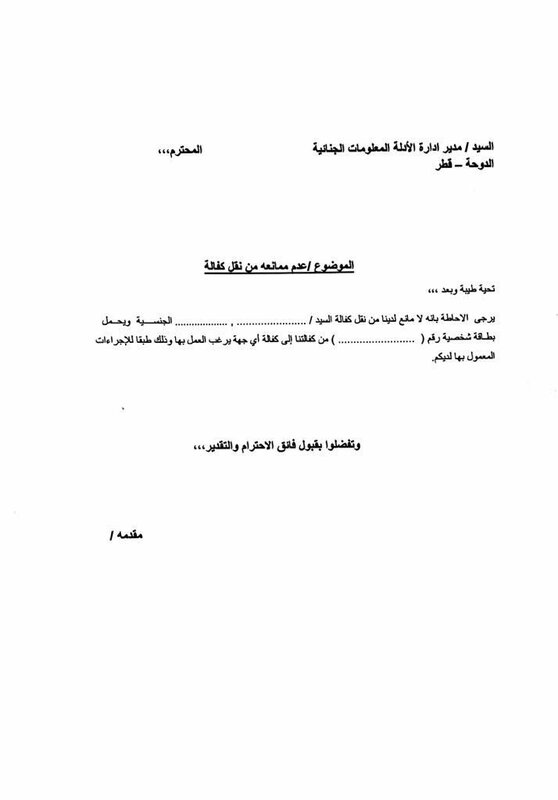 The 'No Objection' letter (template above) that a sponsor has to issue for the employee to change jobs is still required. Some expatriates who recently changed jobs told Migrant-Rights.org that the process is not as straightforward as promised. Due to fear of penalisation, their names are withheld. Qatar, like the rest of the GCC, thrives on obtuse reforms and obfuscating even the laws it does manage to pass. The much-touted abolishment of Kafala, as we have time and again pointed out, is only a rechristening of old, exploitative practices. It clings dearly to the practices that protect the interests of the citizen, blind to the rights of workers, denying them all justice. So now, post-’reforms’ these are the hoops that expatriates have to jump through. First, a job offer letter/contract from the new employer must be submitted to the current employer to inform them of the intention to change jobs. Second, the current employer, in practice, must still provide a ‘no objection’ letter (see form) to the new employer. Then the official job change process begins. A police clearance must be obtained from the embassy of the worker’s country, attested by Qatar’s Ministry of Foreign Affairs. This must be submitted to the Criminal Evidences and Information Department (CEID) to get a security clearance along with attested educational certificates. Copies of Company Registration (CR) of the present and new employer. A letter/contract from the new employer. Copies of the resident permit and passport. 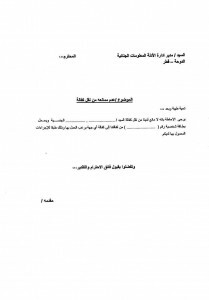 The ‘no objection’ letter template still mentions the word ‘Kafala’ in Arabic. It may well be an old template still in circulation, but that slip only reaffirms that old processes are alive and well. Once a worker receives CEID clearance, the clearance must be submitted to the General Directorate of Passports (Immigration department) together with the job offer letter, educational certificates, CR copies of the present and new employers as well as the no objection letter from the present employer. It must be noted that to acquire the original visa on first arrival, the worker would have gone through all of these processes. It seems rather wasteful that he or she has to do all of it again for a mere job change, placing a premium on a basic right. Workers must also submit a form released by the Ministry of Administrative Development, Labour and Social Affairs (ADLSA). Provided all of the submissions above are cleared, the visa change is approved and the expatriate is issued a new resident permit. The ministry had said that any expatriate seeking a job change through the ministry must submit a request 30 days before the contract comes to an end. In the case of an open-ended contract, the notice period is 30 days if the duration of service is five years and 60 days if the duration of service is more than five years. After this stipulated notice period, the process begins. “The (job change) process is long, it took me almost four months to change jobs, it requires a lot of paperwork, and even now we need no objection letters from the present employer required. However, unlike before, the employer cannot object to an expat employee changing jobs. Initially, my employer objected to my job change, but then they agreed as now there is an option to approach the Ministry of Administrative Development, Labour and Social Affairs,” said one expatriate who has worked in Qatar for more than 10 years. Even if there is an option to appeal an objection, given the skewed power equation, many workers are still intimidated as they fear reprisal if they seek job change. The Ministry has also issued a model form on its website for workers and employers to notify the other party about a change of job, to terminate the contract or leave the country. The first is to inform the employer of the desire to end the contract and leave the country or change job. On March 16, the ADLSA announced that as many as 5,196 workers successfully changed jobs after completing their employment contract or working five years of an open-ended contract. The ministry stated that the numbers reflect a significant increase from 2,288 job transfers recorded last year, before the new sponsorship law. Released data also shows that 184,338 exit permits were issued for expatriates in the first two months since the new law’s implementation. The Exit Permit Grievances Committee – the body established to settle exit disputes– received 761 complaints during the same period. Taking action on the grievances, exit permits were granted within 72 hours in 485 cases, 63 are currently under consideration and in 213 cases workers received an SMS indicating the reason their application was rejected. Between December 13, 2016, and February 15, 2017, 74,049 expats were permanently deported from Qatar after notifying their employer, according to the terms of their contract. Now, revisit these numbers, keeping in mind that migrants (or expatriates) make up over 85% of the 2.6 million population. The job change process is relatively easier for white collar workers and more complicated for blue collar workers. “Many labourers approached the management and asked to be allowed to change jobs. But the company didn’t agree; told them to resign and go to their home countries and come back. The management actually takes advantage of their ignorance and tries to scare them. At least four workers have now submitted their resignation and intending to come back to Doha under a new employer,” according to a South Asian expatriate who works as a heavy vehicle driver at a construction company. But some typing centres in areas where low-income workers reside claim that many are availing their facilities for a job change. These centres offer new services charging between QR 30 and QR50, to send online notifications to employers, as required by the ADLSA as part of the job change procedure.